The New Jersey native was filmed singing America The Beautiful by an NBC television crew preparing for a special NFL Kick-off 2011: Back to Football show to be screened on Saturday. He sang the same song for a performance that aired nationally on September 23, 2001 prior to the kick-off of the first NFL games after 9/11. 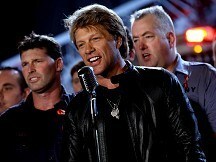 Bon Jovi said in an interview after the latest performance that it was "as moving this time as it was then". Bon Jovi has spent three decades touring with his songs, which include Livin' on a Prayer and It's My Life. The band has sold more than 100 million records worldwide.